Find out why our patients rate our body wraps and scrubs the best in the area. At Serrão Rejuvenation Center, led by Dr. John Serrão, a board certified gynecologist who specializes in anti-aging medicine, our team of experienced providers offer body wraps and scrubs to women in Orlando, Winter Park, and the surrounding areas of Florida. Each day brings stress to your body. We are exposed to environmental pollutants, harmful free radicals, and an ever-changing climate. Many of us do not drink enough water and ingest foods lacking adequate nutrition or foods which may contain harmful toxins. Your body craves relief from these daily stresses. We offer a variety of treatments to rejuvenate your body, mind, and spirit! Our spa concierge will assist you in deciding which treatment would be most beneficial for you body. All wraps are inclusive of our tranquil rain shower and steam room. To avoid a stinging sensation, we suggest that you do not shave on the day of your treatment. Our mineral-rich Black Baltic Body Mud derived from a fresh water lake in Eastern Europe helps to extract pore-clogging impurities while promoting the removal of toxins from the body. Your treatment will start with a exfoliating sea salt, which will then be followed by a Black Baltic Mud purification body wrap with detoxifying essential oils of rosemary, burdock, echinacea, and eucalyptus. You will be allowed to then rinse off in our tranquil rain shower that will be followed by a gentle application of soothing Pomegranate and Cranberry Hydrating Lotion, which are rich in antioxidants. This effective mud wrap stimulates, firms, and smoothes your entire body with seaweed harvested from France’s Brittany Coast. This wrap will rebalance and restore tired and slackened skin with its special toning and firming treatment that will reveal smoother and sleeker skin. A special blending of essential oils is infused into your wrap to assist in firming, toning, and supporting the elimination of toxins from your body. After a rinse in our tranquil rain shower, a final application of warmed, smooth massage butter leaves your skin silky, smooth, soft, and glowing. This anti-oxidant rich body treatment will invigorate the meridians leaving you positively renewed. Your treatment includes our signature Green Tea & Lime Leaf Salt Glow and Black Baltic Mud wrap to stimulate circulation, smooth dry skin, and assist in detoxification. You will be allowed to rinse off in our tranquil rain shower. A gentle application of rich Green Tea & Lime Leaf Hydrating Lotion, which helps to protect and moisturize your skin, will be the finishing touch to this ever-popular wrap. Fight free radicals and soften skin from head to toe. Experience a full body polish with this health-inspiring treatment followed by a natural anti-oxidant body wrap and a generous application of silky shea butter. Active complexes of grapefruit , mango, pineapple, and quince assist in cell renewal , anti-oxidants, and protection for your delicate skin. Let your body and mind float into relaxation while you receive a therapeutic body treatment designed to smooth, refine, and hydrate your skin. Your treatment begins with a creamy Micro-Buff Body Polish to reveal fresh glowing skin. Next, your body will be pampered with a warm relaxation wrap using luxurious European Rose Body Mud to seal the moisture and protect your skin. After a rinse in our tranquil rain shower, a final application of warmed smooth massage butter leaves your skin silky smooth, soft, and glowing. This Egyptian inspired wrap targets the specific skin care needs of each zone of your body. After a whole body exfoliation your skin is prepared for the zone therapy wrap. Your therapist will determine the mapping of therapeutic muds that will best address your needs. Firmi-Sea Body Mud is applied to areas needing firming such as stomach, buttocks, and back of legs. A Hydrating European Rose Body Mud is applied to dry areas such as arms, hands, and décolleté. 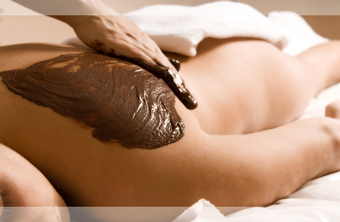 Black Baltic Body Mud is applied to areas needing toxic extraction such as the shoulders, upper back and back of arms. Your wrap is followed by a soothing all-over body massage to put you in the zone. Unveil silken skin with an exfoliating and hydrating treatment utilizing a special Milk and Honey formula. Your entire body will be polished to reveal fresh glowing skin, followed by an application of replenishing butter containing vitamins A, B, C, E, K, collagen and lecithin to soften and protect your skin. The skin is thoroughly exfoliated by the application of your choice of a Sea Salt or an Exotic Sugar Scrub. This invigorating treatment stimulates circulation and new skin renewal. Enjoy a warm rinse in our tranquil rain shower and the aromas of our cleansing steam. This treatment ends with the application of a hydrating body butter. Energizing! When you visit Serrão Rejuvenation Center you can expect your experience to be both effective and relaxing. Our providers have extensive experience in applying both body wraps and scrubs to women, so you can expect the best results for your skin. Treat yourself to one of our body wraps and scrubs. Serrão Rejuvenation Center, led Dr. John Serrão, a board certified gynecologist who specializes in anti-aging medicine, is proud of offer our skincare treatments to patients in Orlando, Winter Park, and the surrounding areas of Florida. Contact us to schedule a consultation, meet our talented MedSpa providers, and begin your rejuvenation today!